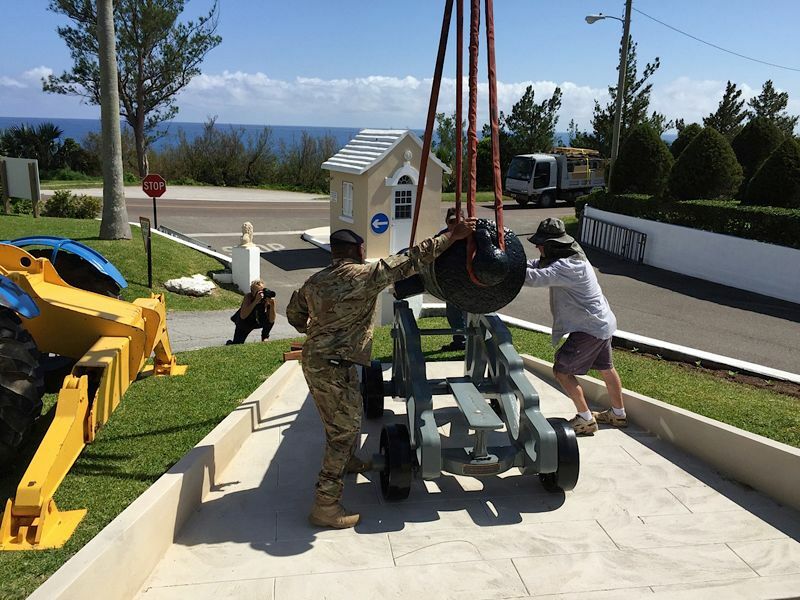 As a part of the 50th anniversary celebrations of the Bermuda Regiment this year, the National Museum of Bermuda has placed an historic cannon at the entrance to Warwick Camp, the home of the Regiment. 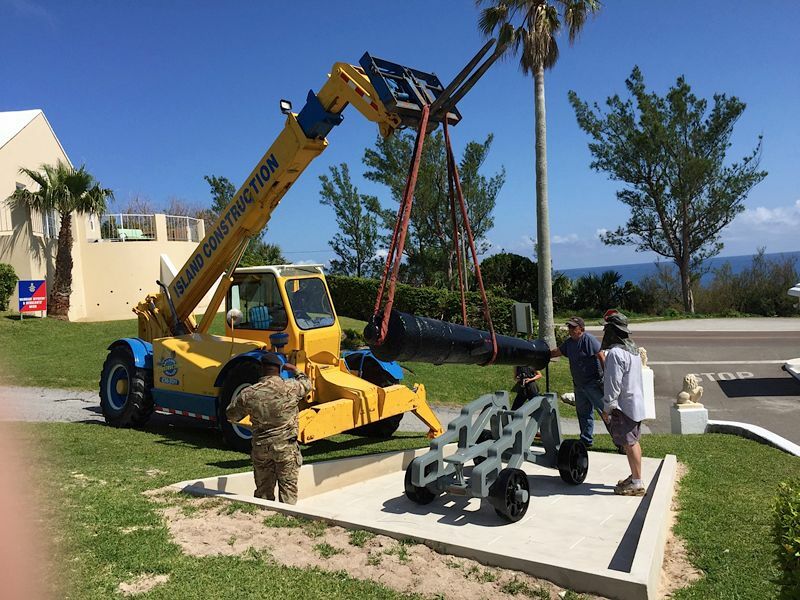 The cannon and carriage will be officially dedicated in a ceremony in October 2015 when the contributing donors, including the Bruce Sharpe Family, will be formally recognized. “The cannon itself is from the Napoleonic period and is dated 1807. It was made by the Carron munitions company, famous for its unique gun called a ‘carronade’, two of which adore the front of Government House. The cannon is almost ten foot long, with a bore of six inches, making it a 32-pounder. “It was made during the reign of George III and carries a “King’s Broad Arrow,” which was a symbol to be placed on anything bought for the British military. “For many years, the cannon was used upright in a wharf as a bollard for mooring boats, so that the salt water has damaged the bottom half of the gun. Nonetheless, the gun is a good example of the 32-pounder, which was one of the largest guns in the early nineteenth century. 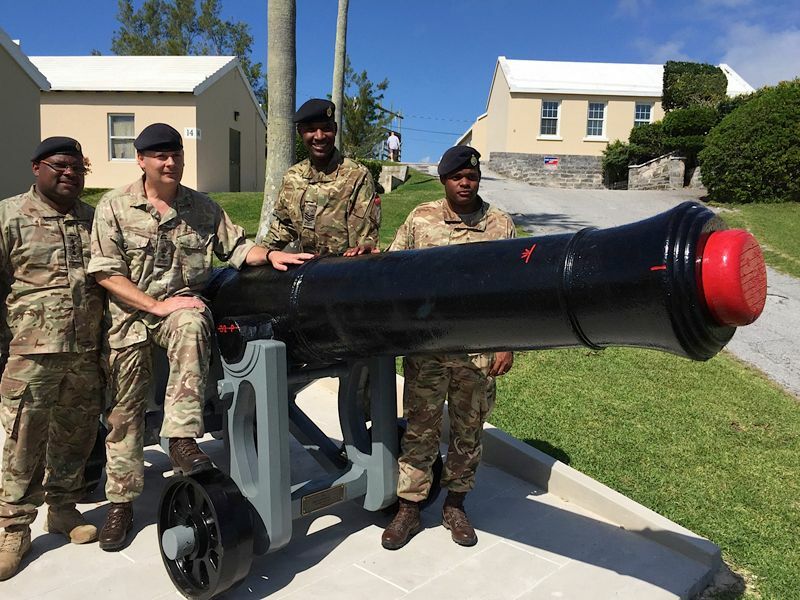 “Bermuda is fortunate to have a collection of over 150 historic guns, ranging in age from the late 1500s into the beginning of the twentieth century, as represented by the big ‘rifles’ at St. David’s Battery, once manned by the Bermuda Militia Artillery, one of the found corps of the Regiment. Commanding Officer Lt. Col. Michael Foster-Brown said, “We are very proud of the heritage of the Bermuda Regiment since its inception 50 years ago in 1965, and of its forebears the Bermuda Militia Artillery and the Bermuda Rifles, a legacy on display at the Military Museum at Commissioner’s House, National Museum.